My client, Sara Zeff Geber, at the trade show with the display for her consultancy. This year I did brand development, a website and a campaign for LifeEncore, a counseling service to help soon-to-be-retired folks to determine what their retirement will look like. This is a necessary step before these folks try to do financial planning for retirement. 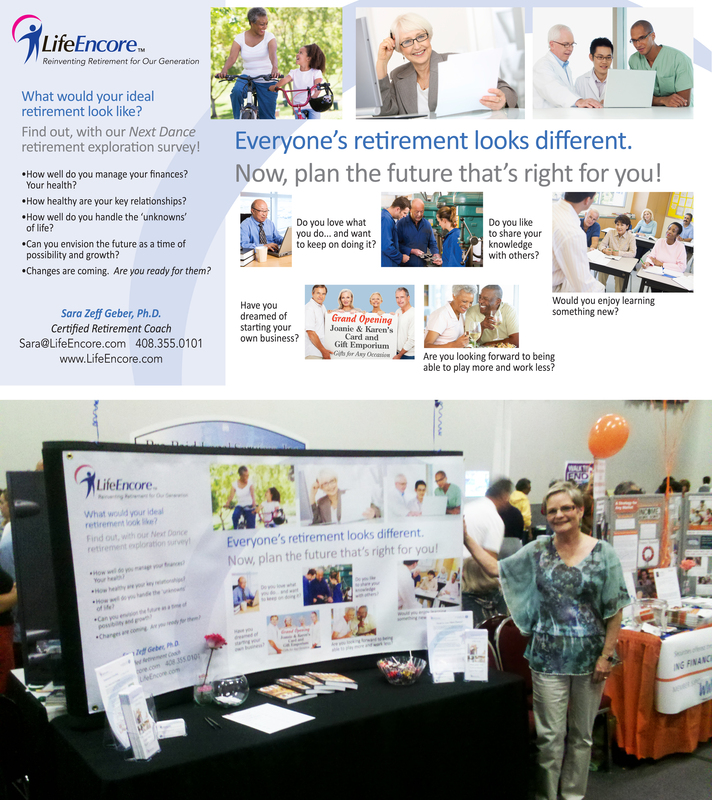 My client just did a “trade” show where almost-retired folks – primarily boomers – were attending . She asked me to create a simple trade show panel for her that works with her brand and generates conversation. I am so pleased to hear that she got a TON of qualified leads – and she says it’s because her display and message were so strong! Woo woo! This entire project has been fascinating as I’ve had a chance to really take a look at the world of the baby boomers – the generation who now is facing an uncertain retirement. These people really need help in trying to plan retirement – the when, the where, the how… Plus many of them are doing some caregiving for elderly parents, and this adds to the uncertainty of their situation. Getting them to start talking about retirement is a huge hurdle. In developing LifeEncore’s brand and communications it’s once more become clear to me that most creatives will try to soften the concept of retirement so as to not ‘offend’ the prospect. They use symbols like ‘nest eggs’ and other such nonsense to try to concentrate on the positive, but in the process, they lose the prospect through their tip-toeing around what really needs to be said. My client and I have deliberately chosen a very straightforward approach — one that shows seniors a number of options that they may be thinking about, dreaming of, or even dealing with right now. What’s exciting is, while not ‘highly conceptual’, this straightforward direction is working extremely well for them, both in the direct-to-consumer side, and the B2B side where LifeEncore will work with a financial planner to help clients envision their retirement, or inside companies where management would like to transition retirement in order to take advantage of the retirees’ advanced knowledge and potentially use them as mentors – providing some reduced income that nowadays can be welcome. When you’re working on development of space advertising, trade show displays or other communication that is a quick look (Actually even direct mail can be in this category), it’s generally best to figure out how to just say it like it is, and make the benefit of talking to you a clear proposition. Most people would rather be spoken to as adults – and it’s always best to treat a customer as they want to be treated. The bottom line: Don’t let your agency or designer over-think the way you’re communicating with your prospects. You’ll end up with better qualified prospects, and more of them, in the end. It takes a smart, strong client to not allow their work to get hijacked by a designer or agency who’s trying to create a more interesting portfolio… instead of just getting the job done them most effective and responsive way possible. Want to see the rest of the work I did for LifeEncore – the logo, collateral, website and more? Just email me at cwl@worthington-levy.com and we can get some pdfs out to you, pronto.